It's that time again! I can not believe that it is December. 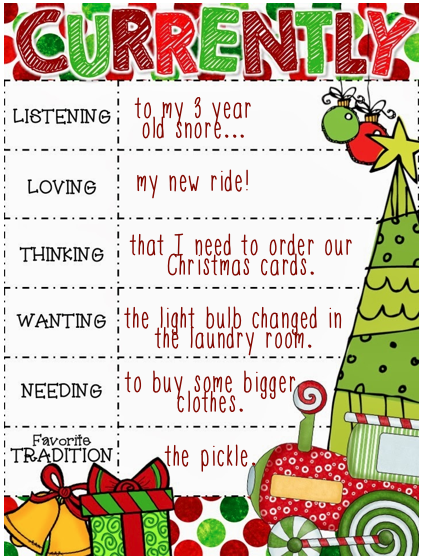 We are linking up with Oh' Boy Fourth Grade to share Currently. I enjoy this linky so much. My husband and I finally invested in a larger vehicle. With a new baby on the way (in 19 weeks) we will need something to drive our 5, 3 and newborn children in. We bought a black Ford Expedition. Everyone keeps telling me how much gas I will be buying, but I have to have something larger. It has third row seating and will be nice when baby #3 arrives. I stopped at Kohl's after church today to get a couple more tops. This baby bump is more than a bump!! I feel huge!! I need to buy some more pants soon!! My husband and I hide the pickle ornament on the tree each year. The niece or nephew who finds it first on Christmas gets a dollar. I know it isn't much, but they love it. When our own children get older they will enjoy the fun too. Time to end this post with a freebie. 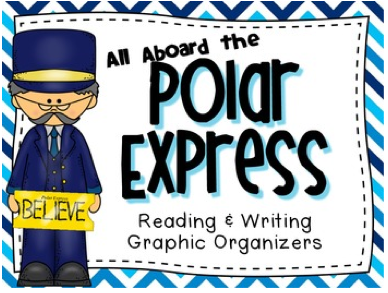 I have been working on this Polar Express Graphic Organizer pack for a few days. Enjoy. Oh my goodness. I need to order our Christmas cards as well. I can't believe how fast the holidays are approaching! Your little one must be exhausted!! Hope you're enjoying your new car! So funny, as I am reading your "listening to" I can hear my BIG man snoring like crazy on the couch! I guess he didn't get much sleep with me hacking and coughing all night! Congrats on the new baby on the way...that is such a blessing to be looking forward to! I also do the "hide the pickle" on the tree. My daughter (who is 13) thinks it is really funny that we still do it, but I can't bring myself to stop! Happy Holidays to you and yours! I love little kid snores, but I'm sorry to hear that he's under the weather. We have a pickle on our tree too, and we also have a chili pepper! Not sure where it came from, but it's fun! Enjoy your new car! How exciting for your baby bump to be growing larger!!! Congratulations and Happy Holidays! That is very exciting about the baby bump! The new car is also very exciting as well! I love that pickle tradition. It sounds like a lot of fun! I know exactly what you mean about needing larger clothes. I'm almost 19 weeks along & my wardrobe choices are getting smaller each week. Congrats on the new cars too - so exciting!